What Do Cheese and Fireworks Have in Common? What do cheese and fireworks have in common? It’s a riddle for the ages. Though cheese is not generally explosive (an internet search for exploding cheese turned up little more than a contemporary art piece by Ed Ruscha, a roadside shop in Wisconsin specializing in both cheese and fireworks, and a scary-looking brand of Pringles) they certainly both liven up the end of a lazy summer barbeque! Thankfully, you don’t need any special training or permits to unleash a cheese plate this July 4th for your backyard festivities… Saxelby Cheesemongers has put together the perfect Independence Day cheese selection that is explosive just where it needs to be… your tastebuds. This Fourth of July weekend, let somebody else man the pyrotechnics station. You and yours can sit back, relax, and relish the veritable flavor explosion of fine farmstead cheese! Order online at saxelbycheese.com and have your cheese shipped straight to your door in time for the weekend festivities! Oh Say Can You See (Cheese)?! 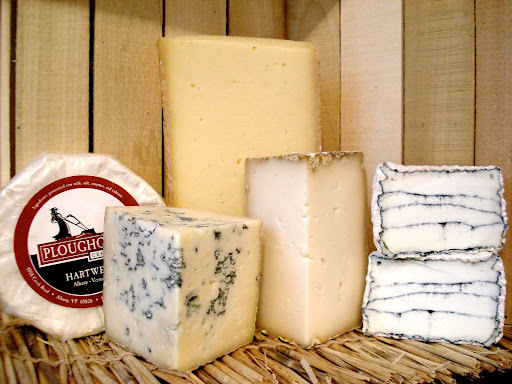 Hartwell, a gooey, mushroomy, and buttery round of pasteurized cows’ milk cheese from Ploughgate Creamery. Magic Mountain, a nutty, salty, citrusy seasonal raw milk cheese made from a blend of sheep and cows’ milk at Woodcock Farm. Bayley Hazen Blue, a raw cows’ milk blue from Jasper Hill Farm that is rich, fudgy and chocolatey to boot! Marbarella, a tangy, pasteurized goats’ milk cheese layered with vegetable ash from Lazy Lady Farm. Goat Tomme, a wedge of minerally, grassy, and earthy raw milk cheese from Twig Farm. And as always, it’s time for our weekly rundown of Cutting the Curd, our delightful dairy dispatch on the Heritage Radio Network! Just in time for Independence Day, I got a chance to chat and chew the cheesy fat with Sasha Davies and Kurt Dammeier, the forces of nature behind this year’s American Cheese Society Conference in Seattle, aptly named Cheeseatopia. Listen in and learn all about America’s cheesiest annual gathering! You thought your family reunion took that prize?? Think again!